A photograph of a 1963 illustration by MIRKO HANAK of Czechoslovakia. 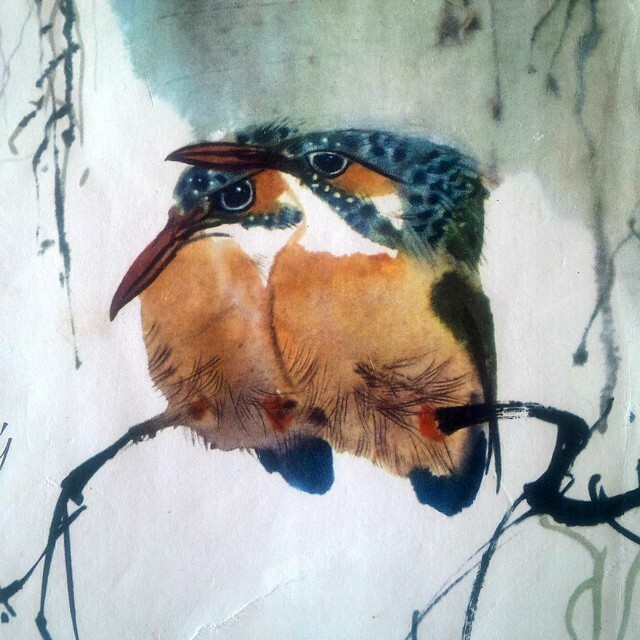 Today I learned that Kingfishers do not nest in trees or on the ground, but rather dig a tunnel in the side of the bank and lay their eggs on what the poet Charles Olson calls “rejectamenta”,..
not on bare clay, on bones thrown up in pellets by the birds. (as they accumulate they form a cup-shaped structure) the young are born. Well, the “fetid mass” is not so exciting to contemplate, but the rest of this is quite interesting. How did I not know this before now? A review of Wikipedia on “Kingfishers” was eye-opening. What an awesome blog and great picture. That’s very nice of you to say. Thank you. Since this post I FINALLY spotted my first Kingfisher’s nest(s). It was quite exciting.